Joe Shannon grew up near Kiltimagh, in County May, Ireland. All of his seven older brothers played traditional music. When he was a young boy, his cousins and neighbors gathered at night at his family's home to play fiddles, flutes, tin whistles and melodeons. Shannon began to play the tin whistle but at first had a hard time keeping up with the others. "I had to learn," he said, "because there was nothing else, and at that time, when I was a kid, there was no radio. There would be people ... from the villages around that would come into my house because they knew it was a musical house, see. I heard all this traditional music being played while I was growing up in Ireland, and I never lost it." In 1926, his family immigrated to the large Irish community in Chicago, looking for a better life. There, Shannon became interested in the uillean pipes, a distinctive form of the bagpipe that emerged in Ireland in the early eighteenth century. The uillean (the Gaelic word for “elbow”) pipes have a chanter with a two-octave range and a bellows instead of a blowpipe to inflate the bag. To play the instrument, a musician fingers the chanter with both hands while using one elbow to work the bellows and the other elbow to operate a set of regulators, or extra pipes, to produce harmonic or rhythmic accompaniment. By the 1920s, the once-great tradition of playing the uillean pipes had almost vanished. Shannon was introduced to uillean pipes by his uncle, Eddie Mullaney, who taught him the rudiments of playing this most difficult of Irish instruments. Encouraged by his cousin and using an instrument lent to him by another musician, flutist Paddy Doran, Shannon learned to play pipes while still in elementary school. "I was so small," he recalled, "I had to stuff books around my stomach to keep the pipes from falling off me." Later, Shannon said, the pipe maker Patrick Henneley "provided" him with a full set of pipes. Although he never took formal lessons, he was heavily influenced by local musicians and especially by the early recordings of the famed uillean pipers Patsy Tuohey and Tom Ennis. In 1934, Shannon was invited to play in the Irish Village at the Chicago World's Fair with the céilí band organized by step dancer Pat Roche. After the World's Fair, Roche's Harp and Shamrock Orchestra made several recordings for Decca. When the Roche group disbanded, Shannon continued playing at Irish functions throughout the Chicago area. However, opportunities for public performances of Irish music waned during the Depression, World War II and the immediate postwar period. Local musicians played for fund-raisers and community events, but the significance of Irish music in the daily lives of the Chicago Irish seemed to fade. Shannon was part of this larger societal shift as the priorities in his life changed. He married and had a family and, to earn a living, he became a firefighter and put aside his music. 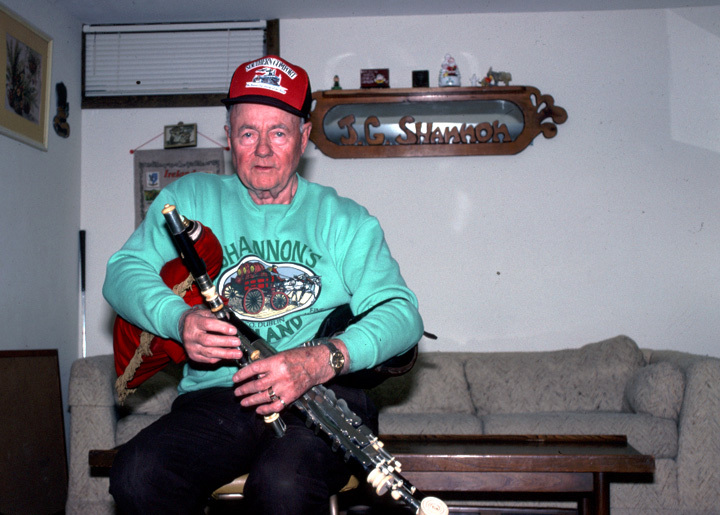 In 1967, Eddie Mullaney gave Shannon his set of pipes that were made by Taylor of Philadelphia around 1880, and Shannon began to play again with a renewed fervor. After retiring from the fire department, he devoted himself to his music. He played with the Chieftains and resumed his local performances at community events. Over the years, playing jigs, reels and hornpipes, Shannon developed his own style, utilizing an American-influenced kind of ornamentation with single and double grace notes, passing tones, trills, single rolls, double-cut rolls and staccato triplets. "They refer to my piping as the American style of piping," he said, "because we're different than what they do in Ireland, that's all. I learned from records, recordings of great pipes that were here in the early part of the century in the 1900s, guys that weren't never in Ireland. The tones are the same, but it's just something that's in me, see. It seems that I grace every note, and I don't know, just fast movements of the fingers. I'm doing it, and I don't know I'm doing it." Shannon, Joe, et al. Irish Traditional Music from Chicago, Vol. 2. Rounder 6006. Shannon, Joe and Johnny McGreevy. The Noonday Feast. Green Linnet 1023.